Proudly owned by Laurie Grann of Rhode Island. 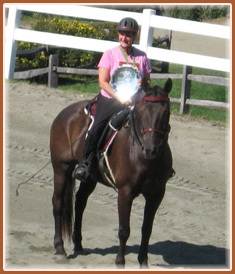 I am so pleased to announce that LBF Diamond Jim Brady "Jimmie" found his forever home with Valerie Bentley of CT this spring. Val has had Jimmie at home getting to know him and working with him before she sent him of to the trainers for several months. Jimmie had been green broke and now he is off for more education. I will be following them closely and hope to be riding down the competitive trails with him and Val in the not too distance future. Many thanks Val for choosing Jimmie for your next partner. He will share Val's beautiful pastures with her older gelding Peter. After buying him back in 2008, Rhett found a new home this past fall '09 with Jo Johnson, Juaquima a Freno Morgan Stock Hoses, Sanger CA. It is with great excitement that I announce the sale of LBF Cimmeron Ladd to Stella Pence of Portsmouth, NH. 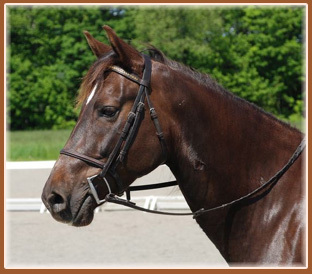 Laddie as we call him was started in harness as a two year old by Bruce Brink of Danville, Vermont and then was trained under saddle as a three year old by Gene Limlaw of Weathersfield Vermont. Gene spent a a lot of time riding Laddie in the Vermont hills. Due to no fault of Laddie he developed a terrible abscess on his entire neck and chest after being shipped off to a trainer as a four year old. He arrived choking after a 32 hour trailer ride (which should have taken 12 hours) with a commercial shipper who had tied him too tight in the trailer. Wether he developed the abscess from the choke or the banamine will never be determined. 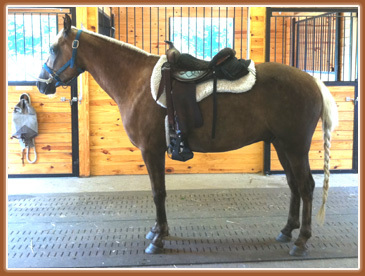 It took a year for this lovely gelding to heal and be able to go back to work. 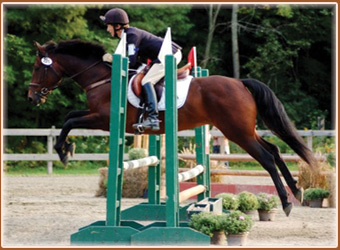 This spring I sent him to Jane Hamlin, a well known event rider who rides and trains out of Pirouette farm in Norwich, Vermont. Stella had come to see Laddie before he went to Jane and liked what she saw. After Laddie and Jane had worked for a couple of weeks Stella went and rode him and it was LOVE. 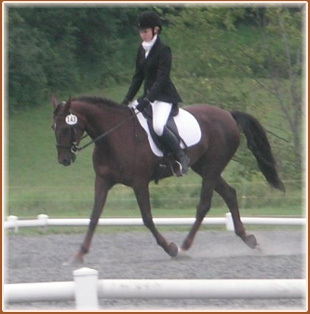 Congratulations Stella and I hope you have a great time with this fabulous boy in the dressage ring and on the trails. Well, beautiful LBF Cimmeron Ladd is happily settled in his new home at 4.0 Farm in Stratham, NH and I am in heaven!! I knew when I came into your barn in the dead of Winter and saw his cheerful, inquisitive little face peering out at me the from the X-ties that it was love at first sight. But prudent buyer as I am, I forced myself to wait until he was once again under saddle in the capable hands of Jane Hamlin. In June, two rides on him at the end of a longe line at the walk and trot cemented the deal - he was mine! Happily my schedule enabled me to leave him in Jane's care until September. I rode him twice a week thoughout the Summer under Jane's watchful eyes, and green though he is, he never put a foot down wrong. Laddie, aside from being beautiful, kind, and incredibly social to both man and beast, is a very serious young man and he takes his work to heart. I may confuse him, I may ask something that is hard for him, but he never says "NO". Sometimes he says "This is hard" or "Wait, wait, I'm just getting it". But I think that's fair. So Laddie and I are enjoying the Fall weather - we are hacking as much as possible, as the Winter will soon relegate us to the indoor arena. He is fabulous on the trail - bright and cheerful but very sensible - a perfect companion. With the help of Beth Adams we continue to develop our work on the flat - now we can pick up both leads correctly and he is very proud of that! ( So am I!) 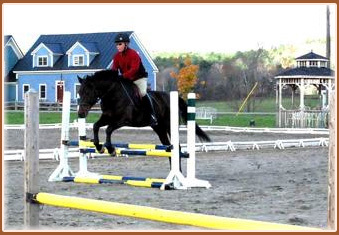 I haven't jumped since I gave up my eventing career five years ago - but I feel those little vibes and I think Laddie and I will soon be popping over X-rails - a good way to dispel Winter's boredom. Thank you, Polly, for raising this very special horse. I knew when I came to you that I would see horses that had been raised not only with good horsemanship, but with love and understanding. Laddie is a perfect reflection of your good stewardship - as his human, I hope I can live up to his expectation of me!" "I bought LBF Chivas Regal from Polly Smith in November 2008, and couldn’t be happier with this 9y/o gelding. Having mostly raised my own Morgans, the search for a new hunting/ endurance Morgan was quite an experience. 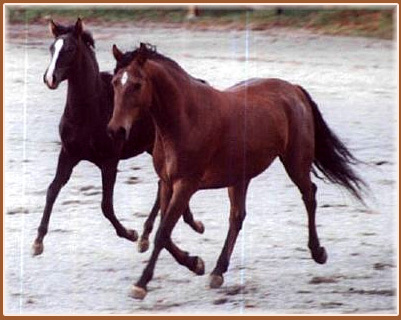 I met many wonderful Morgan horses and Morgan breeders up and down the East Coast. Polly invited me to come stay with her overnight to help make the logistics of my trip more efficient. The time spent at Little Brook Farm confirmed my first impression of an honest and knowledgeable Morgan breeder." "On paper, Regal was not my first choice—he was older, greener and bigger than I thought I wanted. However, from the minute he put his beautiful head in the crook of my arm I was in love. Once on his back I was struck by his strength and bold, forward way of going—traits I was looking for. Ears pricked, Regal carried me down the Vermont roads looking at everything yet always responsive to my seat, legs, hands and voice. By the end of the ride, Regal was at the top of my list. By the time my trip was complete, he was still at the top of my list. 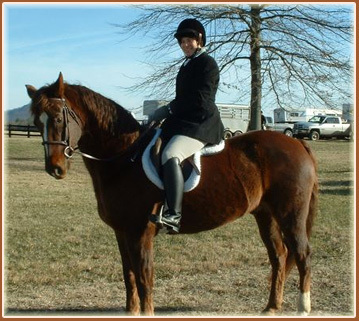 Polly was great; she knew I wanted a horse that would successfully carry me both in the hunt field and over the many miles of long distance (CTR and Endurance) rides. We were both confident that Regal would be a great distance horse, but he hadn’t been schooled over jumps nor been out with hounds, so that was an unknown. 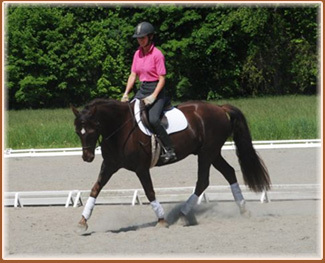 Instead of telling me to take my chances, Polly took Regal to her trainer for some initial jumping lessons and sent me video footage of the sessions." Tomorrow we go for our first jumping lesson. 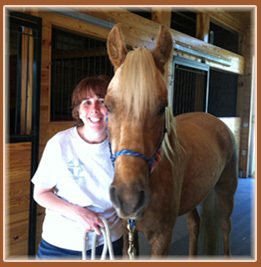 I can hardly wait…"
" I'd recommend Polly to anyone looking for a good using Morgan horse from someone you can trust to tell you exactly what you need to know. We got LBF Rhett Butler from Polly and he arrived a better horse than we even thought we were getting. I found Polly perfectly frank about the horse and she practically insisted to send a same week current video of him. Rhett is just gorgeous and you know if you are getting an intact colt from Polly that he is correct with a good mind and manners. Thanks Polly, as always, it has been a pleasure to work with you." 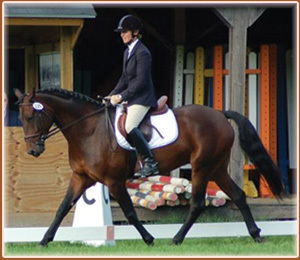 "When we began our horse search we had some pretty specific criteria in mind. Piper is 11 and I have been riding for less than three years. We needed a horse that was old enough to know better, but young enough to grow with us. 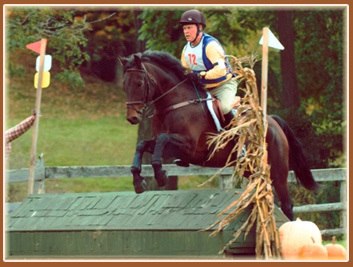 The horse also needed to be experienced at eventing, our chosen discipline, but willing to go back to the beginning with two less accomplished riders. Finally, it was very important that whatever horse we chose was happy with their job so it would be fun for all of us. This seemed like a pretty tall order so we began our search in January hoping to find a horse by spring." "Would you believe April was the first horse went to see? We are still stunned at our luck. She met every one of our criteria with ease. April is sweet, alert, curious, affectionate, and smart. The vet said she was incredibly solid and the perfect choice for a first horse. 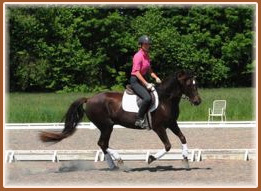 Her canter is easily the most comfortable I’ve ever sat and my trainer says you could set a metronome to her trot. Her ability to gage her rider is simply amazing and I am thrilled every time I see the way she takes care of my daughter. April seems to be up for just about anything. 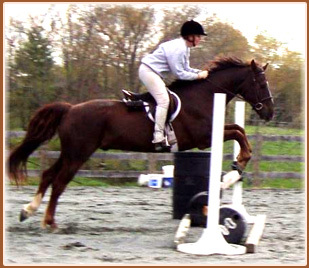 She is an incredible jumper and approaches every fence with such enthusiasm we use them for a reward after flat work. This is a girl who loves her work. Thank you Polly for breeding such an exceptional horse and Erin for all of the love and hard work you gave her. We are thoroughly in love and feel so privileged to have her as part of our family." It’s been a long time since we’ve last kept in touch. Much has been going on and I’m sure you’ll be excited to hear our news. April and I have kept very busy this last spring and summer. We had a pretty laid back winter, but starting in February, we kicked off the season heading south for a few weeks. We trained with Denny Emerson at Tamarack Hill Farm in North Carolina where we both enjoyed getting gout of the freezing cold and indoor ring. In April we did a few schooling events and the first weekend in May we competed at the UNH Spring horse trials where we placed 8th out of 16 with a double clear stadium and cross country round in the pouring rain. 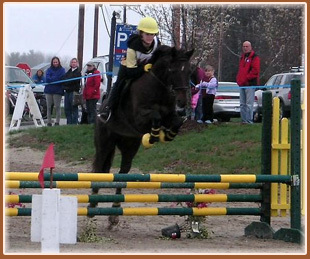 We kept up tiwth the schooling until our next event, Valinor Far HT in MA where it also poured all weekend. We placed 5th in the Beginner Novice Division and were on of the 3 out of 18 to go clean cross country. We finished off at Huntington with a double clear jumping rounds and place 4th out of 16. 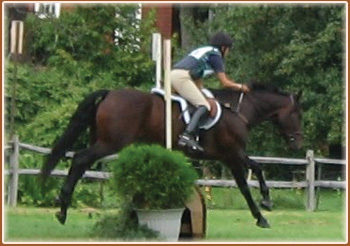 We are qualified for the American Eventing Championships which will be held in Illinois, September 10-14. And we still have 2 more events scheduled before the AEC. April and I have come a long way in our progress and relationship and we are still growing and learning together. She has been such a confidence boost out in the cross country field. She is a jumping machine and she know her job at this level well. She loves to be out there galloping in open fields, running through water, up and down banks, over ditches. People always ask me about her at the events. She’s a true show pony and she loves to be watched while she puts on a show. This horse is filled with character and is such a sweet heart. 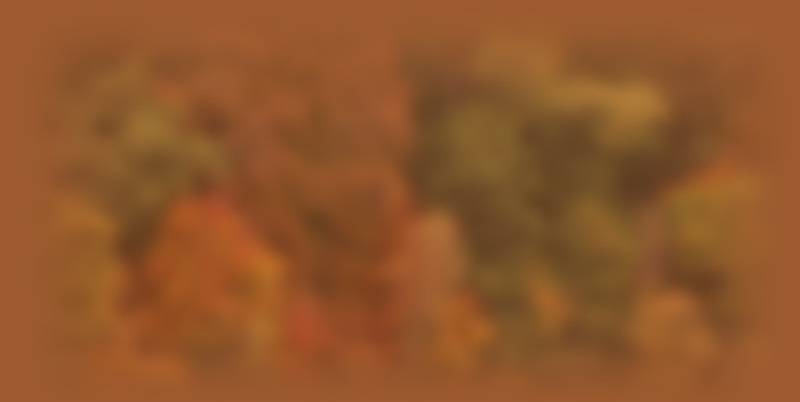 I hope you enjoy our pictures, and I’ll try to continue to keep you updated on ouprogress!" To view Kody's extraordiary life please view his web site. "We wanted to line breed the 'Primavera' lines. We had discovered that blood when we lived in California and met Carol Simpson and Primavera Valdez. Richard and Phyllis Nelsen, Mohican Farms started a strong line breeding program more than 40 years ago, which was rich in Old Government, Brunk & the Old California blood. Valdez and Gay Vaquero were two of the best they produced. 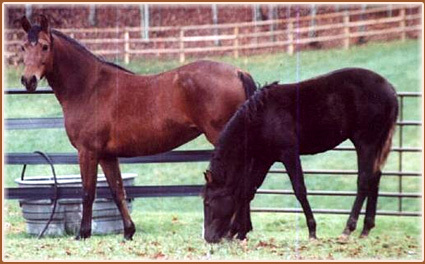 Polly Smith had bought both Primavera Gay Vaquero and Primavera Ramona from the Nelsens, and from this pair she bred LBF Gay Enchantress and she in turn, bred to H-Ken, produced LBF Gay Enchantment (aka "Mandy") whom we bought from Polly as a foal. We were thrilled to find that Mandy was a double-bred Primavera on her damside, as we wanted to cross Primavera Brio, a son of Primavera Valdez, on her. We did that twice over the next 10 years and were so pleased with the line bred offspring that we have retained them both, Gab Creek Rosado and Gab Creek Golden Vaquero. When we got Mandy home as a yearling, we really fell in love with everything about her-her personality, her tractable disposition, and her quick mind. She was the fastest horse to learn something I have ever trained. It was always like, "So is that all you want me to do?" When I started her, we were living in the barn and only had one pasture fenced so I would put all the mares down there for the day and bring them up at night through the woods to the top of the hill and stall them. 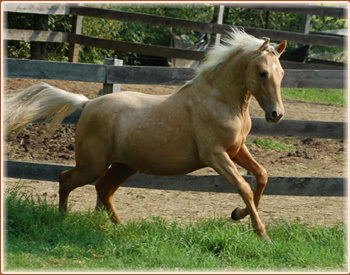 Mandy very quickly became the Alpha or bell mare. One evening I went down and haltered her and lead her over to the fence and used the fence to climb on. The next night when I haltered her, she side passed on her own to the fence for me to get on (so we could hurry up theprocess and go get into the feed bucket up at the barn). By the third time I went down there she would side pass to the off side.....then I tried getting up on a stump and she would side pass over to that. I have enjoyed showing off with her in the aisle of the barn for visitors who all want to know how do you teach a horse to come to you without touching her, to theoff side, to the tailgate of a pickup truck and have her stand there while you climb down on her?? "You don't. She taught herself." Mandy is all business about everything. I have ponied young stock on her. 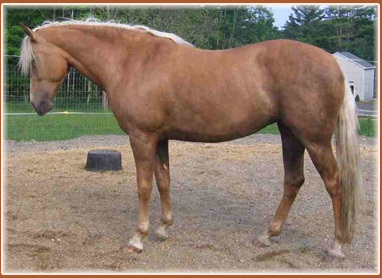 She has always been in a halter or a hackamore and will stop on the pull and slack with one hand. Her foals have been the same way about people and training. She is cat quick and is all in all just a wonderful creature." 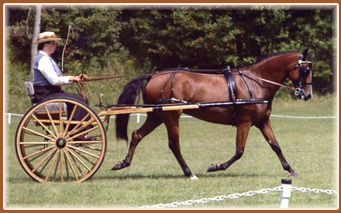 "Pete had done several local dressage shows and one "grasshopper" level event during his 5 year old year. He was still very green and had a hard time concentrating on his work when at a show. This was age appropriate. My goals for the 2008 season were to see continued improvement in all 3 phases of combined training as well as an improvement in his ability to focus and deal with the stresses associated with being at an event. ~4th in area 1USEA beginner Novice with Jane Hamlin as senior open rider. He achieved this award having entered only three sanctioned events. 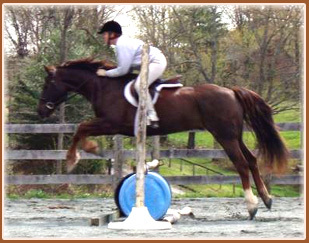 He has been ridden at all of his events to this year by my instructor, Jane Hamlin. Jane and I decided at the beginning of the year that Pete deserved a good start in the hands of a professional and I am glad we made this decision. Pete has continued to improve in all facets of his work and more importantly, has matured and really likes to compete. He now "knows the ropes" and really is a joy to compete. I will start riding him at the combined training events at the end of this season and will ride him all of next year. I have been so pleased with Pete's performance that I took the plunge and purchased his half-brother, LBF Panama Jack. "Jack" is a 2-year old gelding and although I have only had him home a few months, I can already see intelligence, confidence and a kind willingness to work. Jack and I take frequent walks down the road and he shows complete confidence when exposed to a wide range of things, including: tractors, round bales, mail boxes, bicycles, cars, bailers, etc. He willingly walks over tarps and is coming along very well with his trailer loading, which only began several days ago. Teaching him to lift his feet, lead and come to me in the pasture came very easily. He stands for the farrier and unfortunately (two cuts requiring stitches), is outstanding for the vet. He is a great horse." "I bought LBF Son of a Gun (Pete) from Polly Smith in October of 2002. Pete was 4 months old and my first horse. Being in my middle 50's and a first time owner, there were many people who felt a 15-year old 'packer' would have been a wiser choice than a 4-month old Morgan gelding. Nonetheless, I had always wanted to start from scratch with a horse and felt the time would never be better. I fell into a very fortunate situation with a very caring and knowledgeable breeder and a wonderfully kind and talented horse. I have never regretted my decision. 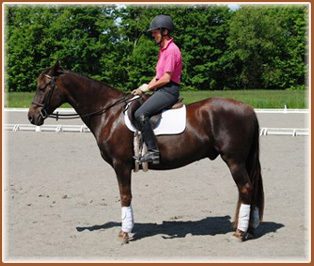 Pete is now 5-years old and had the benefit his initial training with Dixie Doran and, beginning as a 4 year old, the skilled hands of Jane Hamlin. Prior to his professional training, I taught him trailer loading, foot picking, grooming, etc., often with a book in one hand and Pete in the other. 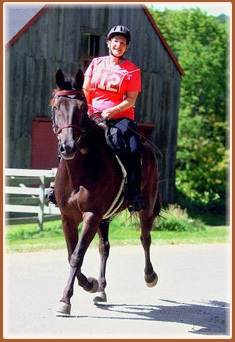 Pete and I took walks through the woods, down the road and across the brooks at the Green Mountain Horse Association. The point is that Pete liked doing all of these things, even with a greenhorn, and easily acquired his basic skills due to his intelligence, curiosity and natural desire to work. Those same personality traits have served him well in his professional training and he is coming along beautifully as a young combined training horse. 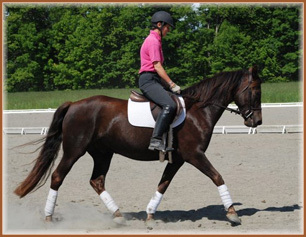 He is an excellent athlete and a wonderful mover as well as being brave, confident and a 'trier'. He is a joy to have in the barn and gets along well with every horse he meets. Pete would not be who he is were it not for Polly Smith. Polly is a breeder with years of experience and a very clear sense of both what she wants to produce and how to make it happen. 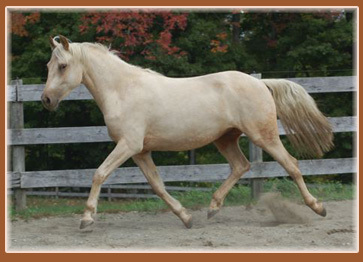 Her foundation mares are all exceptional examples of the Morgan breed. Her offspring are uniformly athletic,conformationaly correct, and temperamentally well balanced. 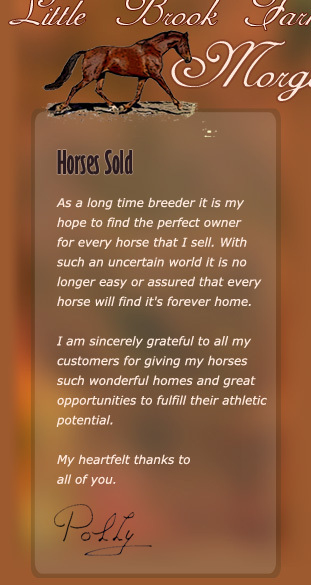 In addition, Polly has proven over and over again to be fair and honest.As a first time owner, I have appreciated her availability and willingness to help me both when I bought Pete and also years after the sale was made. 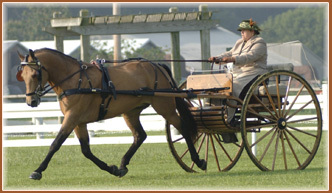 The Morgan breed is very fortunate that people like Polly Smith are in the business." "Remmy is a very special horse. His curiosity is always entertaining, he's an over-achiever always wanting to learn and please, and his conformation and way of going make him a natural for all sport-horse disciplines. He's logged many miles on the trail, which will lead to his competitive career. 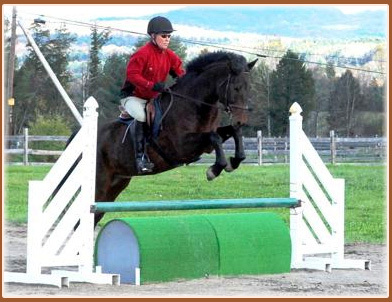 He'll do some dressage tests as a 5-year old, and he's a natural over fences. I've enjoyed all aspects of working with him since I brought him home as a two-year-old." 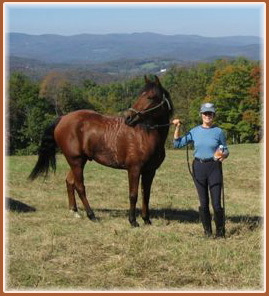 "I purchased Pokey as a long yearling from Polly one freezing cold December day. I had been looking at pictures for quite a while, and had to take the plunge. I went up to her farm with two friends who were supposed to keep me from doing anything rash, like buying a baby! They were unsuccessful. 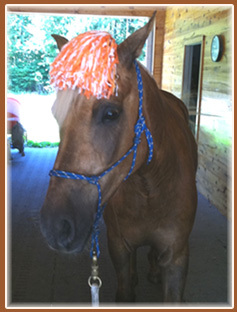 Pokey and I fell in love instantly, and he came home to me in the spring. He was easy to train, even for someone completely inexperienced in starting youngsters, and was a gentle laid back fellow about most things. Polly had warned me he would be big, and oh my. He just grew and grew. First up and up, then wider and wider! Now he is a 9 year old, 1200+ lb., 16+ hand gentle giant." I have been able to achieve a great deal with him, because of his kind nature, excellent conformation and willing attitude. I use him as a pleasure horse, a competitive distance horse, and a baby sitter for my grandchild. He goes camping, acts as an ambassador in our local public parks and is simply a pleasure to be with. His tremendous heart and grit carried me through a very difficult endurance ride this past season, as well as our first 3 day 100 mile ride. He finished both in excellent condition, ears up and sound. He is exactly what he was bred to be, a 'user friendly' amateur horse, capable of doing pretty much anything I set my fancy to, and doing it well!" May '08 - Won preliminary Pony division at Lord Stelling CDE. Sept '09 - 2nd at Laurels at Landhope in the Intermediare Pony division.